Zoom! teeth whitening is the fastest way to whiten your teeth. We perform this procedure in-office in about 60 minutes. Patients notice instant brightening of their teeth and improvement to their smile. Zoom! is the number 1 most requested whitening procedure by patients, and has been performed over 10 million times across the world. Zoom! Teeth whitening has been featured on shows such as ABC-TV's �Extreme Makeover�, The Today Show, and EXTRA to instantly transform a smile. 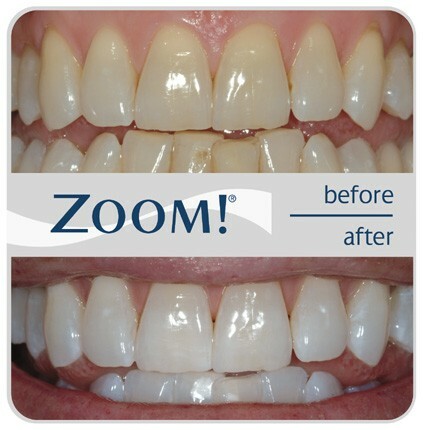 Contact us today to find out more about the procedure or to schedule your Zoom! session today!